I can concur with this review. I picked this beer up recently, and it is surprisingly good. As noted, it has a moderately high ABV, but it is smooth and easy to drink. Regular Moretti, however, is more disappointing. Does Mrs. Beer Crusade know about this mysterious Italian you spotted across the bar? 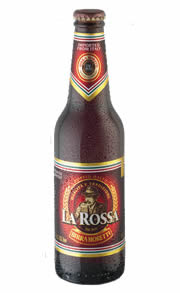 One of my favorites too, and a lot better than the regular Moretti. Nothing like this beer on a hot day with a slice of prosciutto and sophia loren.